In a city known mostly for its incredibly pristine beaches, sparkling blue waters, and abundance of breathtaking views, it’s easy to see why their breakfast reputation could be easily overlooked. But that’s a mistake visitors won’t want to make. From darling cafes with panoramic ocean views to classic diners serving up greasy goodness 24 hours a day to monster-sized dishes that have found their ways onto the popular TV series Man vs. Food, San Diego has it all. 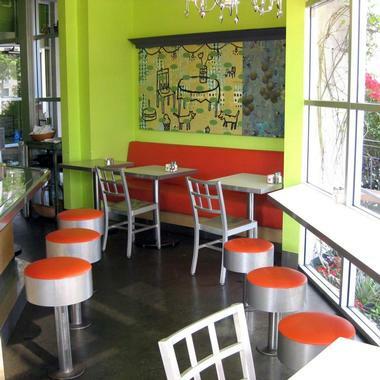 Formerly known as Wow Wow Waffle, Atypical Waffle Company is located in the artsy neighborhood of North Park. 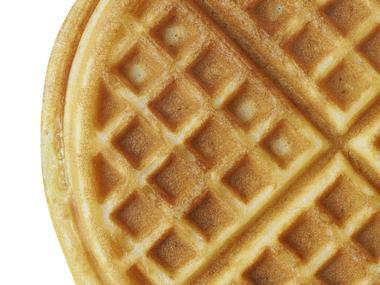 This breakfast restaurant with a pop-up vibe is serving up sensational Liège waffles. Hidden behind a classic looking coin-operated laundromat, the urban café has an adobe-style fire pit, old sports stadium fold-down seats, a makeshift tented kitchen, mismatched dining furniture, and a dominant turquoise color scheme throughout. With all of the delicious options like the Chocolate Lovers waffle, made with infused Belgian chocolate and topped with berries, and the Number Seven – a waffle topped with bacon, brown sugar, goat cheese, and avocado – choosing one won’t be easy. Great Maple is located in the charming neighborhood of University Heights and serves up a deliciously unique twist on modern American comfort food. This San Diego staple has won the “Best New Restaurant Award” from California Restaurant Association’s 30th Annual Gold Medallion Awards as well as two Diners’ Choice Awards in 2017 and 2018. Patrons will want to try their California chorizo scramble, which is mixed with gourmet chorizo, piquillo peppers, fresh cilantro, onions, cheddar cheese, and cilantro sour cream. Diners definitely won’t want to make the mistake of leaving without ordering a dozen of their signature maple bacon doughnuts. For the last 7 years, San Diegans have been lucky enough to regularly consume life-changing breakfasts served from the brainchild of two Colorado brothers at Snooze: an A.M. Eatery. With an energetic and eclectic atmosphere, an emphasis on culinary innovation, and a staff that seems more like family than co-workers, it’s easy to see why there’s a perpetual line around the corner here from open until close every day. Diners will enjoy favorites from the menu like the pineapple upside down pancakes, made with mouthwatering buttermilk pancakes and caramelized pineapple chunks, house-made vanilla crème anglaise, and cinnamon butter. 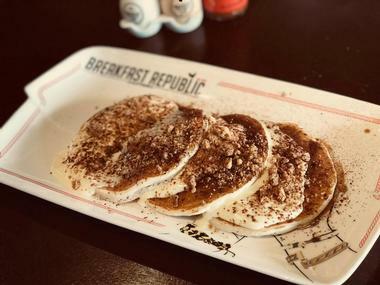 It’s pretty well known around San Diego that Breakfast Republic is one of the go-to spots for some savory early morning eats. With seven locations, visitors and locals alike won’t have to travel too far to satisfy their craving. Exceptional menu items, such as the Jurassic Pork Benedict with a mountain of pork over a sourdough English muffin topped with avocado and hollandaise sauce and served with house potatoes, are sure to satisfy big appetites. Diners with a sweet tooth will be smitten with s’mores French toast – graham cracker brioche bread topped with chocolate sauce and toasted marshmallows. It’s easy to see why Breakfast Republic has become a staple of San Diego. Located in the historic Gaslamp Quarter, Brian’s 24 is one of few restaurants in the neighborhood open 24 hours a day. So, whether folks are early risers or night owls, this is the spot for everyone. This family-run diner offers guests a taste of New American comfort food and they specialize in savory breakfast dishes that are served the entire day. Patrons will enjoy French toast stuffed with strawberries, bananas, or blueberries. They’ll also appreciate dishes like the scrumptious corned beef hash Benedict. Perhaps one of them will even be brave enough to give the Pancake Monster, last seen on Man vs. Food, a try. 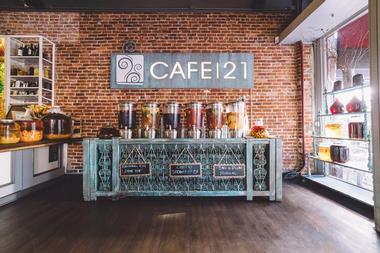 Café 222 is a charming little café located in downtown San Diego. Its big pink letters spelling out the word “CAFÉ” on the roof just above the corners of 2nd and Island Avenues make it easy to spot. This space offers plenty of natural light with its large windows that give it an airy feel. 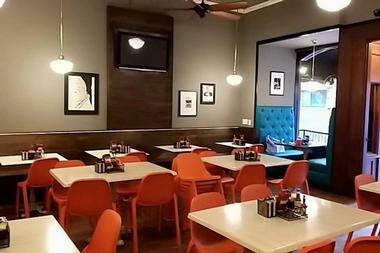 There are two diner-style counters with stools and some tables inside. An outdoor patio wraps around the front and is perfect for those with furry friends. Diners who don’t want to leave their breakfast selection to chance my want to try their famously delicious waffles, which have been featured in Gourmet Magazine. 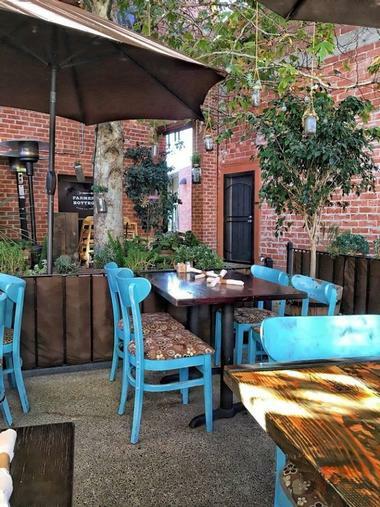 Located in the delightful Mission Hills neighborhood, Farmer’s Bottega will have patrons feeling relaxed in its warm and rustic atmosphere. Exposed industrial fixtures, dimly glowing Edison bulbs in the chandeliers, and reclaimed decor give the restaurant an organic feel. This restaurant prides itself on only using locally sourced organic foods. Their fresh and healthy ingredients offer an exquisite farm-to-table dining experience for diners. 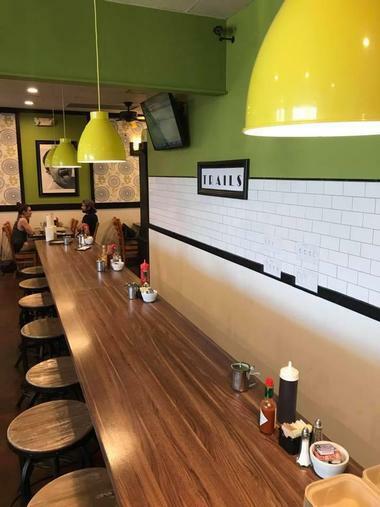 It’s no surprise this restaurant has gotten the nod from many local media outlets with breakfast dishes like the Mission Hills omelet, made with apple-smoked bacon, blue cheese, scallions, avocado, and Oaxaca cream. The original of three locations, this Fig Tree Café is located in the laidback, surfer-friendly neighborhood of North Pacific Beach. It’s situated in an aging cottage located just a couple of blocks from the Pacific Ocean. Diners can expect a dog-friendly patio under a canopy of trees that provide ample shade and a plethora of fragrant and colorful tropical plants and vines that provide a country/beach ambiance. 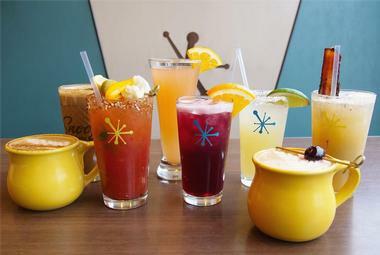 Guests can kick off the day with a rejuvenating cup of Mexican mocha coffee or an “on vacation” mimosa. They shouldn’t overlook the Monterey scramble mixed with scallions, bacon, jack cheese, Ortega chilis, Mexican rice, and black beans. Whether it’s a group of friends meeting for weekend brunch, a family looking for a fortifying breakfast before embarking on their San Diego adventure, or a local looking to snag a quick cup of coffee on their way to work, Harbor Breakfast is a charming and quaint café everyone will love. Their menu options include dishes like the roasted red bell pepper omelet made with asparagus, green onion, zucchini, and herbed cream cheese or the corned beef hash with two eggs any style. 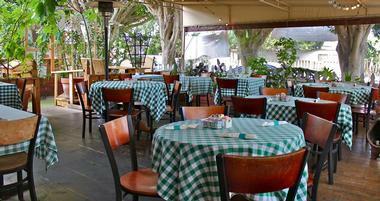 The tantalizing menu and upbeat urban diner vibe make them a must-visit breakfast spot for travelers. Hash House a Go Go is located in the trendy and popular neighborhood of Hillcrest. 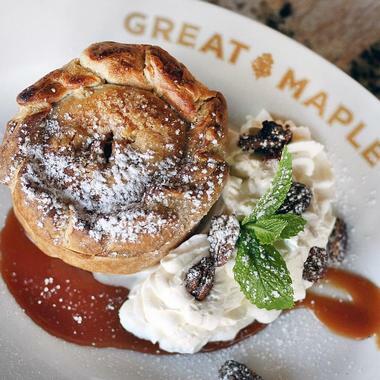 Since opening its doors in 2000, the restaurant has garnered a lot of attention in the breakfast scene and has found its way into several other cities nationwide. Piquing the interest of national media favorites like Spin Magazine, Man vs. Food, the Travel Channel, and the Rachel Ray Show, this is pretty much a mandatory stop when it comes to San Diego breakfast spots. Guests can eat their way into a delicious food coma via the famous meatloaf house hash with roasted red peppers, fresh spinach, and smoked mozzarella. Hob Nob Hill is located in the Bankers Hill Neighborhood of San Diego. The restaurant sits adjacent to popular Balboa Park and the world-renowned San Diego Zoo and has been a staple of America’s Finest City since the 1940s, garnering the attention of Diners, Drive-Ins and Dives. 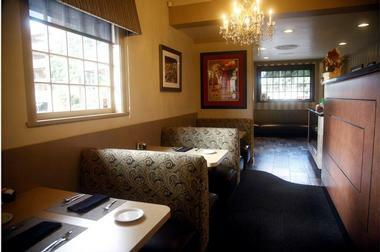 It has regularly received accolades from the Southern California Restaurant Writers Association. Patrons can start their breakfast off with a Hibiscus Mimosa or a Bloody Mary, then move on to a bacon-stuffed Belgian waffle or the delicious Hob Nob Breakfast Slider with one egg, bacon or sausage, and American cheese. Jake and Eggs is a quirky yet excellent popup breakfast joint located in the Ocean Beach neighborhood of San Diego. 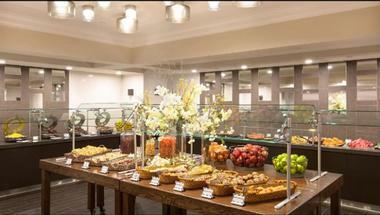 The charming breakfast space can be found at Sundara Indian Cuisine during hours outside that restaurant’s operation. Guests can start warming up to their day with a nice hot cup of locally roasted and organic coffee from Dark Horse Coffee Company while they wait for their breakfast entree. Sweet potato hash made with a russet potato, squash, a sweet potato, poached eggs, scallions, fresh herbs, and fire-roasted poblano is a good choice here. Bacon can be added for a few extra dollars – totally worth it. This beloved San Diego staple serves up hot java and probably the best breakfast you can find on the Pacific Beach boardwalk every morning, and all without breaking the bank. Visitors will find it adjacent to iconic Crystal Pier. The perpetual line outside Kono’s Café hasn’t diminished in 27 years, and for good reason. Try delicious eats like their egg burrito with chorizo, jalapeño, avocado, onion, green pepper, cheese, and pica salsa wrapped in a flour tortilla. Another good bet is the French toast with bacon and scrambled eggs. It’s easy to see why it’s a local favorite. 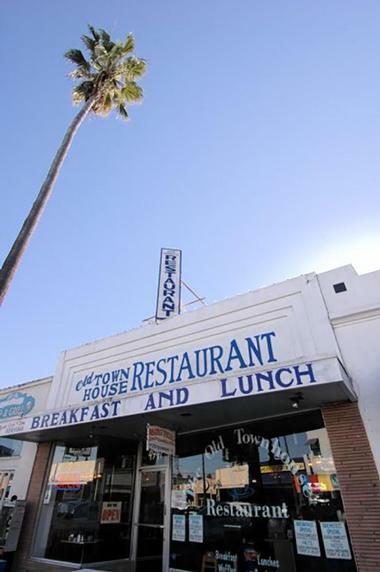 Located in what many locals would consider the heart of coastal San Diego, Old Townhouse Restaurant suits this laidback Ocean Beach neighborhood. A straightforward American diner, they’ve been serving up delicious coffee and sensational breakfast to their patrons since 1973. Guests will want to try their Meatlovers Omelet made with bacon, ham, sausage, and cheese or their chicken-fried steak with three eggs any style. They also pay homage to San Diego’s Latin influence with some south of the border options like the Machaca, which is shredded seasoned beef, two scrambled eggs, bell peppers, onions, and tomatoes. 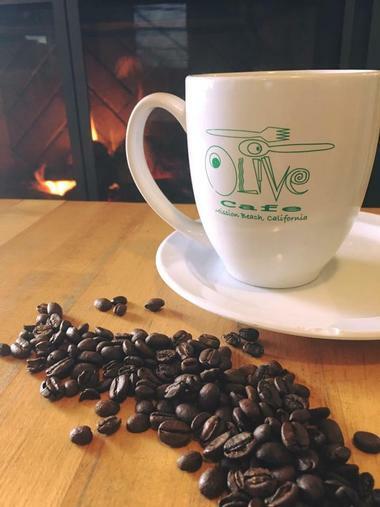 Located on a strand of land tucked between the sparkling Pacific Ocean and San Diego’s popular Mission Bay, Olive Café has been filling stomachs and delighting souls in the eccentric coastal neighborhood of Mission Beach for many years. The light-yellow walls are adorned with the works of local artists, while warm wood flooring and a charming fireplace provide a cozy and relaxing ambiance. Guests will enjoy menu items like the Aegean Scramble, made with three eggs, green pepper, tomato, and feta cheese, topped with basil, and served with hash brown potatoes and toast. Other favorites include banana walnut pancakes, berry brandy cream cheese French toast, and acai bowls. 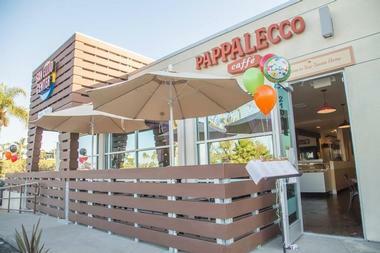 Pappalecco is bringing the taste of Tuscany to America’s Finest City, serving up their mouthwatering eats and soul pleasing coffee at six locations across San Diego County. Believing there should be a piece of Tuscany in every corner of the world, chef and co-owner Lorenzo Bucci has attributed a lot of their success to the authenticity and simplicity of their menu as well as their unusually welcoming long-time restaurant staff. Patrons have been known to drive well over 10 miles daily to indulge in their organic Tuscan coffee and delightful breakfast croissants. Adventurous diners should try the smoked salmon croissant with egg, mozzarella, arugula, and a balsamic glaze. 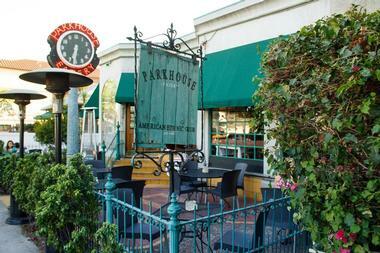 Parkhouse Eatery is located in the friendly, urban neighborhood of University Heights. 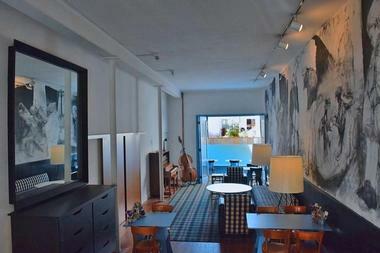 This unique space is inside an old home that has been repurposed into a charming café. Guests can enjoy coffee and breakfast in their beautiful garden patio or in their living room with large windows that provide plenty of natural light. The Hearth Room is a warm and cozy option featuring a wood burning fireplace. New guests will want to try their popular chilaquiles, made with crispy tortillas, house-made red chili sauce or tomatillo sauce, and topped with sautéed onions, cilantro, Cotija cheese and two eggs any style. Since 1960, when they opened their first pancake house in Wilmette, Illinois, the Walker family has been delivering quality family dining and excellent service to its patrons. 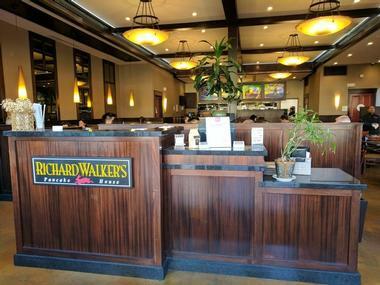 In 2006 San Diego was lucky enough to host the first of two Richard Walker’s Pancake House breakfast restaurants in the vibrant Gaslamp Quarter. Eight years later, a second location was added in the swanky seaside neighborhood of La Jolla. The rabbit symbol represents family, comfort, and abundance – it’s a “welcome home” sign for guests. Anyone will feel at home with an order of the Summer Raspberry Crepes and a cup of their Central American prime roasted coffee. 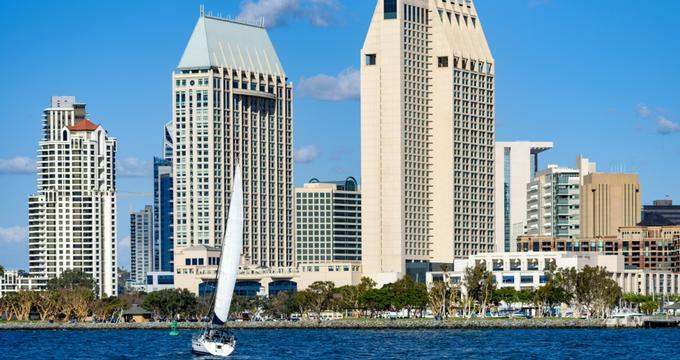 Seaview Restaurant is located inside the impressive Manchester Grand Hyatt Hotel in downtown San Diego. It’s conveniently situated between the quaint Seaport Village shopping area and the San Diego Convention Center. Diners will have the chance to indulge in one of Downtown’s best breakfast buffets, which features freshly baked pastries, waffles, scrambled eggs, prepared-to-order omelets, sausage, crispy bacon, breakfast potatoes, yogurt, fresh fruit, cold and hot cereal, muffins, breads, bagels, teas, juices, and coffee. Not staying at the hotel? No problem. This is also a great meeting place for Sunday brunch, where friends can catch up over great food and $14 bottomless mimosas. 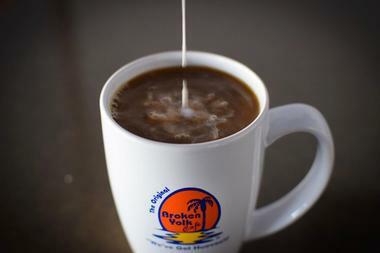 The Broken Yolk Café is probably San Diego’s most well-known breakfast eatery among locals and return visitors. This San Diego treasure originated in the laidback surfing community of Pacific Beach back in 1979 and has been pleasing droves of people ever since. Patrons will love sipping their morning messy caramel latte before breakfast. 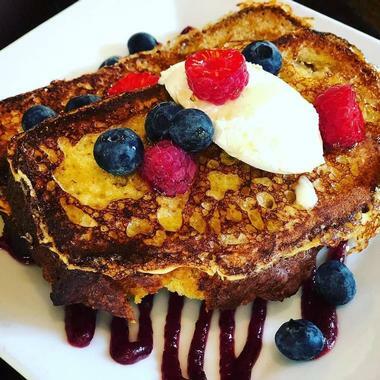 Newcomers should try a plate of the delicious Tiki Toast made with three thick sweet Hawaiian bread slices dipped in egg batter, grilled to golden brown perfection, and topped with blueberries, strawberries, powdered sugar, shredded coconut, and caramel drizzle. After breakfast, it’s a short drive to spectacular Pacific Beach for a day at the beach. 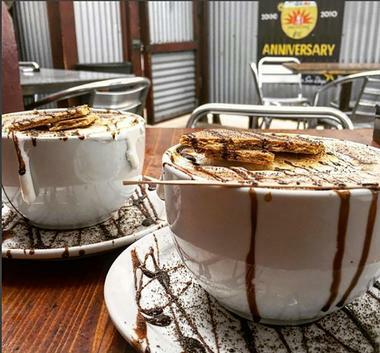 Appropriately named The Mission, this café is situated on Mission Boulevard in the quirky Mission Beach neighborhood of San Diego. It has been a favorite with locals since it was a small coffee house back in 1997. The Mission has garnered national acclaim, winning multiple culinary awards and being featured in numerous culinary and travel publications. A great choice for a savory breakfast entree is the Mission Chilaquiles with roasted tomato ginger sauce, corn tortilla chips layered with cheese and black beans, and topped with chipotle cream. 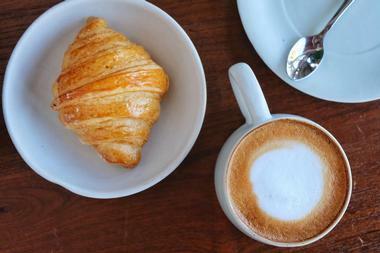 Tucked between Mission Bay and Pacific Ocean, there will be plenty to do after breakfast. The Trails Neighborhood Eatery is an unassuming diner located in east San Diego County near Mission Trails Regional Park. If it weren’t for the line of customers out the door, it might be hard to find, but once inside the delightful aroma of freshly made bacon and brewing coffee paint a different picture. 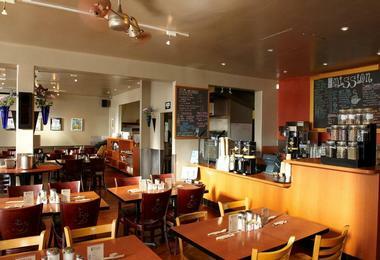 Since appearing on the Food Network’s Restaurant Impossible, this café has grown exponentially in popularity. It has been delivering delicious eats like their mouth-watering Sin-a-mon Roll Pancakes, their breakfast burrito with potatoes, bacon, cheese, avocado, and scrambled eggs wrapped in a large flour tortilla, and their Piggyback Bene with pulled pork, chipotle, avocado, and hollandaise cilantro. It doesn’t get any more kid-friendly than The Waffle Spot at the King’s Inn hotel in Mission Valley. This family favorite breakfast restaurant means there’s a good chance the kids won’t want to eat anywhere else. The adorable diner has been a San Diego staple for over 20 years. Colorful animated murals on the walls, a delightful turquoise and purple color scheme, and a collection of coloring book art from talented junior artist diners add to the fun. 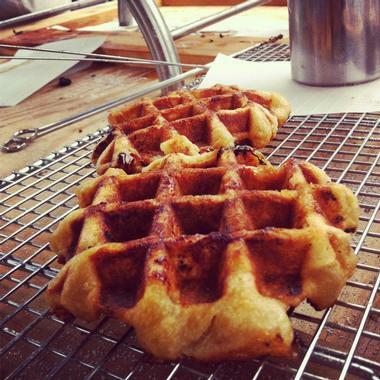 It’s no surprise that waffles steal the show here, and patrons will want to try mouthwatering waffle favorites like banana walnut, apple cinnamon, and double cup with dark and white chocolate chips. Being able to easily distinguish one surfer from another while they hang ten right in front of the restaurant is a big plus at Woody’s Breakfast and Burgers. Enjoying a cup of coffee and a delicious breakfast while watching the surfers is a pretty San Diego way to start the day. 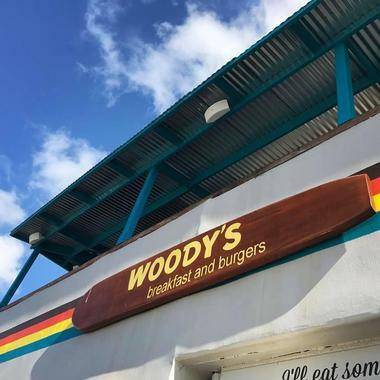 Woody’s Breakfast and Burgers is located across the boardwalk from uber-popular Pacific Beach and is literally about as close as diners can get to eating on the beach. Guests can enjoy simple breakfasts from a yogurt bowl with Greek vanilla non-fat yogurt topped with blackberries, bananas, strawberries, and crunchy granola or one of several cleverly named savory scrambles.